A fan has unveiled a secret message in Metal Gear Survive. I'm not going into the messy break-up between Konami and former golden child, Hideo Kojima—it's well documented already—but suffice to say, all eyes were on Konami and its first Metal Gear game post-Kojima, Metal Gear Survive. While both Konami and Kojima have remained, understandably, taciturn on the matter, it would appear that the developers left behind have their own way of conveying their thoughts about the way they parted company with their (big) boss. Right at the beginning of the campaign, you'll get prompted to add your name, and will shortly see it listed on a clipboard with a load of others. Eagle-eyed Twitterer NourishedPsyche noticed that the initials of the names around it spell it KJP FOREVER, with KJP widely used as an abbreviation of the now defunct Kojima Productions. Coincidence? Maybe. But it's harder to dispute when you see the second image NourishedPsyche posted—the initials say the same thing again, only this time the letters run up from the bottom of the screen. Metal Gear Survive is out now on PC, PlayStation 4, and Xbox One. We've known for a while that Metal Gear Survive would feature micro-transactions, but we only recently discovered that it also charges its players for extra save slots. 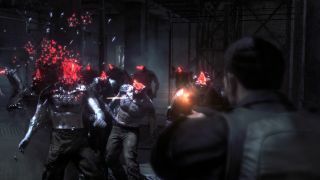 We're still putting the finishing touches on our Metal Gear Survive review, but James wasn't particularly keen when he previewed it last month, saying: "right now Metal Gear Survive is just a functional survival game built in the shell of one of our favourite stealth games ever."